Download AIO Wallpaper, Coloring Pages, and More! We’re always up to something here at The Odyssey Scoop. Today, we’re pleased to announce the expansion of our Downloads section. 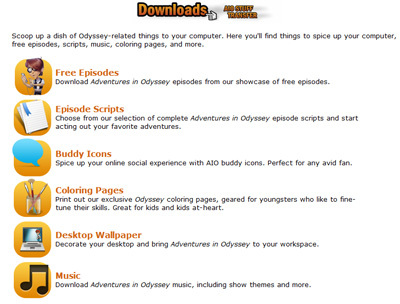 Downloads features a great new look, plus expanded areas including coloring pages and more Odyssey music. We’ve given this section a brand-new look and added some new features. New to the Scoop are a nice collection of Adventures in Odyssey coloring pages, great for youngsters who love AIO or kids at-heart! You’ll also notice we’re making this section more easily accessible from our dropdown navigation as well. 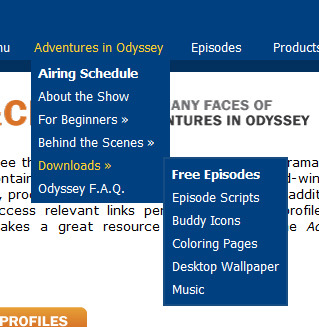 Adventures in Odyssey fans can easily access our selection of downloads. We’re always trying to think of ways to appeal to all ages and backgrounds at The Odyssey Scoop. Whether you’ve been listening to Adventures in Odyssey for two minutes or 20 years, we want it to be a useful resource for new and long-time listeners… a place where fans of all ages can just be fans. So how are we doing? Feel free to share your feedback in the comments below. Also, what else do you think we should add as future downloads? Head over and enjoy our expanded Downloads section (also accessible from “On the Menu” on the navigation bar as well).